Step aside, Niko - Liberty City is about to meet Tony Stark's personal brand of justice. With all his guns, gadgets, and snark, you'd think that Iron Man would be perfect for his own in-depth video game saga. Unfortunately, so far he's only appeared in mascot brawlers and a couple forgettable movie tie-ins. Two Marvel fans evidently decided that that wasn't good enough, and took it upon themselves to mod the iconic power armor into Rockstar's Grand Theft Auto IV. If you've ever wanted to fly through a sandbox city fighting crime (or more likely, causing it) as Tony Stark himself, now's your chance. The mod, somewhat confusingly titled Iron Man IV, features several varieties of the Iron Man armored suit, from previous models of Tony Stark's armor to other famous robots like War Machine and Stan Lee. Players will have a hefty arsenal at their disposal, with miniguns, dart launchers, mini rockets, and repulsor beams. And it just wouldn't be Iron Man if you couldn't use the armor's thrusters to propel yourself at ludicrous speeds through the city's skies - which you totally can. The mod even transforms the game's HUD to Stark's holographic display, though there's sadly no sign of JARVIS. Aside from the addition of these suits and weapons, it's still Grand Theft Auto, and the rest of the game is more or less the same. No supervillains have set up shop in Liberty City so there are disappointingly few appropriate targets for your new ordinance, unless you don't mind watching Iron Man go berserk on civilians and cops (who will actually deploy some power armor of their own). On the other hand, the mod supports online multiplayer, so you can always grab a friend and duke it out as Iron Man versus War Machine. 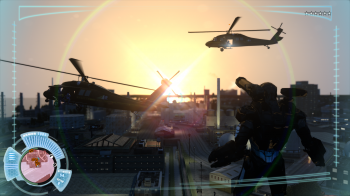 Owners of Grand Theft Auto IV on PC can grab the mod for themselves right here. And if any of you happen to be experienced GTA modders, a single-player Iron Man campaign would not go amiss. Just saying.